I stumbled across John Birmingham’s “Axis of Time series” because book 1 was free in the Kindle store (Great idea, Amazon or John or his publisher). After thoroughly enjoying ‘Weapons of Choice’ at the gym and while folding clothes in the Kindle’s robot voice, at the car wash, etc. I bought book 2, and added 3 to my Universal Wishlist. 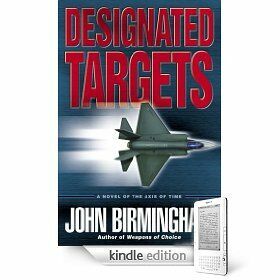 Sunday morning I was getting ready to fold some clothes, so I grabbed my Kindle, went into the menu for ‘Designated Targets’ and what do I see? Start Text to Speach, is grayed out. Sure enough, someone; John or his publisher has decided I’m not allowed to use the book I legitimately purchased in any way I please. The decision was made that I couldn’t listen to the book while I did something else. I really hope that publishing wakes up sooner than (have they yet?) the RIAA/MPAA. I can’t stress this enough, this time in history for publishing is the same as the launch of iTunes, napster before it, etc for music and movies. So far publishing seems to be going down a similar path. I also hope that Amazon makes it clear on product pages, which Kindle editions have been crippled, so that I can avoid those books. It’s a bummer for sure, but I won’t support such practices.